A Kilsyth councillor says she couldn’t live with herself if she got cash-strapped North Lanarkshire Council to pay for her trip to New York. Councillor Jean Jones will head across the Atlantic in April to officially represent the council in her capacity as North Lanarkshire provost during the Tartan Week celebrations. Also participating in the trip is North Lanarkshire Schools Pipe Band and Education convener Councillor Frank McNally – who will also be travelling at their own expense. The biggest event in the festival is a huge parade down 6th Avenue on Saturday, April 6. 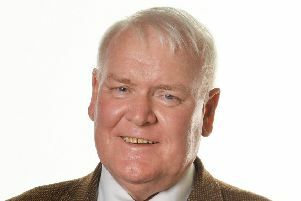 Provost Jones said: “It is a fantastic opportunity for the young people and I’m sure there will be other provosts there at taxpayers’ expense, but considering the financial challenges facing the council and the millions we need to save there was no way I could have asked for the council to fund my travel and live with myself. A total of 48 young people, who attend schools all over North Lanarkshire, will be jetting off to the States for this massive celebration of all things Scottish and they are currently hard at work fundraising and seeking sponsors to support them. The band was invited to New York after a phenomenal season of competition last year, winning Scottish, British and European championships . Jim Park, Principal Music Instructor with the council, said: “Fundraising activities in preparation of the pipe band’s visit to New York this year are very much ongoing. “The young people and their families have been working extremely hard behind the scenes to raise as much money as possible to allow this exciting opportunity to happen. “From performing concerts and impromptu playing at supermarkets, to selling football cards and organising a ceilidh, there’s lots of fundraising activity taking place. “A number of local businesses have also come forward to financially pledge their support and we would like to take the opportunity to appeal for any others to back our young people, who are brimming with excitement at having the chance to perform during Tartan Week.